Our private English-speaking guide and driver will pick you up in time at the airport. A paper board with the sign of BeijingToursGuide.com and your name will be held high at the airport exit. Then transfer to hotel, the rest of day is free at your own leisure. Have a hike in the Mutianyu Great Wall. After lunch, visit Changling Tomb, Jade Factory and Olympic Green. Enjoy the Chinese Acrobatic night show. Mutianyu Great Wall: The most spectacular section of Great Wall but less crowded. You can choose a round way cable car to help reach the wall (cable car cost is not included in the price). Changling Tomb: The ancestral tomb of Ming Tombs which is the sacred background of Ming Dynasty emperors. Olympic Green: An Olympic park which is the home to the well known Bird’s Nest and Water Cube. In the morning, visit Tiananmen Square, Forbidden City; in the afternoon, tour in Silk Factory, Summer Palace. Tiananmen Square: The largest city square in the world. Forbidden City: A world reputed royal palace. 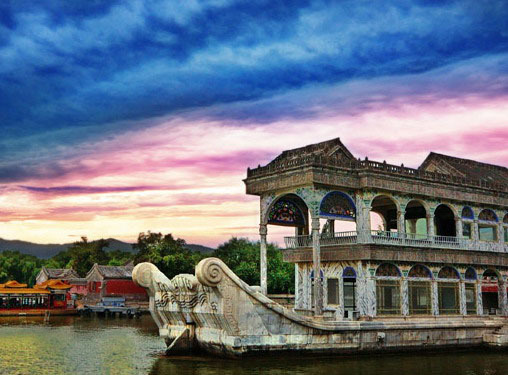 Summer Palace: A famous royal garden of imperial family for their rest and entertainment. It is a good choice to relax your heart under the beautiful sceneries. First visit the Temple of Heaven and then have a Hutong tour with rickshaw. After the lunch with a local Hongtong family, be transferred to the airport. Temple of Heaven: A royal temple where Chinese emperors held prayer and sacrifice ceremonies to Heaven for a good harvest. Hutong tour with rickshaw: Hutong is where old Beijingers live. Pay a visit to the local Hutong family and have a dumpling lunch together. Besides, beautiful lake sceneries and places of interests are also rich in the Hutong area. Rickshaw trip is so wonderful. Departure Every Day with even 1 person. * Admission fees for all of the sightseeing spots listed in the itinerary. * Meals as listed in the itinerary. * Hotel as listed in the itinerary. * English-speaking tour guide and vehicle for transfers & sightseeing. * Free visits to handicraft factories. * Service charge & government taxes. * Luggage transfers between airports and hotels. * China life tourist accident/casualty insurance. * Entry or exit Beijing airfare or train tickets. * Gratuities, tips to guides or drivers. * Hotel fees are based on two people sharing one room with twin beds. * Do not want to join a group tour? Click to check our 4-Day Beijing Private Tour. * Discount for children from 2 to 12 years old differs according to your tour size. * If you are a group of 10 or 10 people above, please contact us, we could give a very competitive discount. * If you need to prolong your stay in Beijing, or arrive a few days earlier, please let us know and we’d be happy to extend your hotel bookings, or arrange additional tours for you. Copyright © 2010-2017 Beijing Xian Tour. All Rights Reserved.